Pokhara was a discovery in several ways. It has a laidback charm that contrasts with the rush and pollution of capital Kathmandu. Standing by a lake, with forested hills on one side and snow-capped Himalayan peaks on the other, was an unforgettable moment for me in Pokhara, the picturesque Nepalese city that is arguably its tourism capital. Pokhara was a discovery in several ways. It has a laidback charm that contrasts with the rush and pollution of capital Kathmandu. The translucent Phewa lake provided some breath-taking vistas and the experience of observing the peaks of the Annapurna range at close quarters was memorable. Sarangkot, a hill station near Pokhara, offers spectacular views of the Annapurna range and I was told to reach there early to witness the snow-capped mountains change hues in the rays of the rising sun. I left my hotel at 4 am and reached the designated point well before the sunrise. As I waited, there was no sign of the sun. There were clouds and mist and much as I wished they disappeared, they would not. I, however, did not leave the place disappointed. The scene of the valley below was clearer and almost like an image from the sky. The houses looked tiny and there were vast swathes of greenery. As the valley undulated, with Phewa lake almost in the middle, smaller hills gave way to bigger ones and to still bigger ones. On the agenda during the day was a boat ride on the lake’s tranquil waters. The 15-minute ride to Tal Barahi temple on an island in the expansive lake presented panoramic views as the backdrop shifted from forested hills to the mountains. A gentle breeze blew across, adding to the pleasant feeling. Pokhara has a few tourist and religious spots near the lake. I visited Devi’s Falls, which gets its name from a Swiss citizen Davis who was swept away by its gushing waters in 1961 while taking bath with her husband. Her body was later recovered after a lot effort. Not far away is Gupteshwar Mahadev cave — its upper part a temple to Lord Shiva. The lower part, which is reached by some deft walking, leads to cascading waters that spring out from rocks after going underground at the Devi’s Falls. 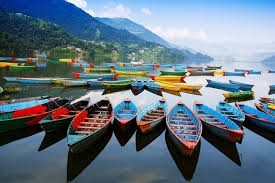 Pokhara offers good shopping options and almost all that you get in Kathmandu’s tourism district of Thamel is available here, sometimes at a better price. The place is also popular with adventure-lovers who have a wide range of options, including paragliding, rafting, sky-diving and mountain trekking. There are eating options galore, with restaurants serving a variety of international cuisines — Korean, Indian, Chinese, Japanese, Italian, French and Thai. One of my fondest memories in Pokhara is of working while seated outside a restaurant on a table and chair crafted from a log of wood. Working on my computer in this setting, with people of different nationalities and in different moods passing by, was quite different from the usual work in a formal setting. While Pokhara was a treat, reaching the city from Kathmandu was not. The nearly 200-km road journey took two hours more than the seven it usually takes. There was road repair work on in Kathmandu which led to unusually long snarls. The best time to leave Kathmandu for Pokhara is early morning when there is less traffic in the capital city. The other option is to take a flight. Among the charms of a road journey is that a large part is along the Trishuli river. There are agricultural fields carved into hill slopes, delicate bridges that connect villages to the main road and colourful houses. There are several eating options on the way and we opted for a landscaped restaurant that served an authentic Nepali thali — largely comprising green vegetables — and the piping hot food helped beat the tiredness. As I was packing my bag after a satisfying visit, my roommate asked if I had gone to the terrace see a clear view of the peaks ofthe Annapurna range. As I stepped out on the terrace, the view of Machapuchare (also known as fish tail mountain) was mesmerising. The 6,993-metre mountain, revered by the locals, was shinning in golden hues in the morning sun alongside other peaks of Annapurna range. It was a sight to behold. But then, all good things must come to an end and it was time to return to the mundane world.